Schneider Electric’s Xavier Moreau explains how to ensure the highest levels of microgrid availability and stability. 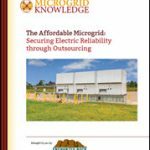 The paradox of microgrids is that they are often implemented to address concerns about heightened reliability and quality of energy supply, but their stability, when in island mode, is a very delicate balancing act. Indeed, their relatively small size makes them prone to instabilities. For example, whereas the largest generation asset in the main grid (such as nuclear power plant) represents less than 3% of total generating capacity, in a microgrid it might be more than 20%. This makes the failure of a single genset (when in island mode) impossible to mitigate without shedding load. It requires operating the local grid close to stability limits with little reserve margin. The challenge is heightened when a large share of microgrid generation relies on variable renewable energy such as wind and solar. Alternators’ rotors in large power plants in the main grid have the inertia of their rotating mass to smooth frequency instabilities and react instantly to contingencies. But wind turbines that use static power electronics have little spinning (or kinetic) reserves to provide to the microgrid, which is vital to maintain frequency and dampen fluctuations. This is even worse with solar photovoltaic and its inverters. Because variable renewable source generation occurs in multiple points of a microgrid, variable voltages often exist. And when thresholds are reached, some generators might automatically disconnect, sending the microgrid into a very unstable state that might result in cascading disconnections and load shedding. To maintain uniform voltage throughout the microgrid, technologies such as smart transformers with automatic voltage regulation are increasingly available and can compensate for such variations (for example, when and after clouds pass offer an array of panels at a solar plant). In large microgrids, an Advanced Distribution Management System (ADMS) can coordinate with these transformers by sending them configuration set points and controlling overall voltages dynamically. When connected, the ADMS and its power control system module can also participate in the interchange with the main grid. A complementary solution is to integrate batteries in the microgrid that can, through smart inverters, provide synthetic reserves. Lithium Ion batteries are well suited because of their very fast response times. Algorithms in the microcode of the inverter controller will chisel the waveform to the needs of the microgrid as defined by the microgrid controller. Supplemented with batteries, generation in a microgrid can provide it with several services, such as black-start capability, to energize the microgrid without the interconnection to the main grid, grid forming to set the shape of the sinusoid and supplying the in-rush current required by some machines (such as motors) to start. Ensuring the highest levels of microgrid availability and stability should be sought by multiplying generation sources and thorough work on the management of fast frequency reserves and secondary reserves. For more information, take a virtual tour of a microgrid. Xavier Moreau leads business intelligence, strategy, and marketing for the utility segment of Schneider Electric. This blog originally appeared on Schneider Electric’s site. Microgrids: Are They Mainstream Yet?